Dynamic programmable voice and sound effects. Choice of color co-ordination for your location. Overhead playfield illumination with large 4" score displays. Bright, heavy duty, easy to clean 4.5mm (1/4") thick surface. Center line for Tournament play. The only choice you need to make is what color do you want. 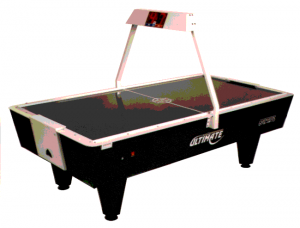 The most complete Air Hockey table on the market today. Tried and proven many times over, this is a "must have" game. • Heavy Duty Blower fan. • Service door at each end of table for easy access. • Operator adjustable game timer. • Australian Designed and manufactured. 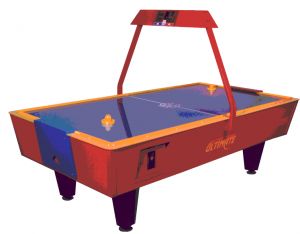 The playing surface of the Gamemasters Table Hockey is tough and durable. 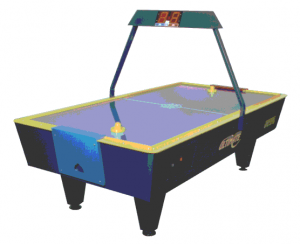 Unlike other manufacturers who use Stainless steel (prone to denting and warping) or only 0.8mm Laminate/Formica (prone to cracking along the air channels) our Air Hockey surface is 4.5mm (1/4") thick to give you many years of trouble free service. The only Table Hockey in the world to give you sound effects, score announcements and background music as you play the game. Imagine what it is like to play the latest pinball or video game with no sound, not very exciting! Gamemasters was the first company to give you Opto scoring for the goals. No messy micro switches to adjust and catch onto the puck. This gives you more playing time and greater customer satisfaction. We even eliminated those timber puck guides at the goals to give you greater speed of play. The guides are welded onto the goals and powder coated smooth.